We are very lucky in our house, we often get fab things to review and I'm exited to share with you this review! We were sent two new Jungle Junction Playsets to review. 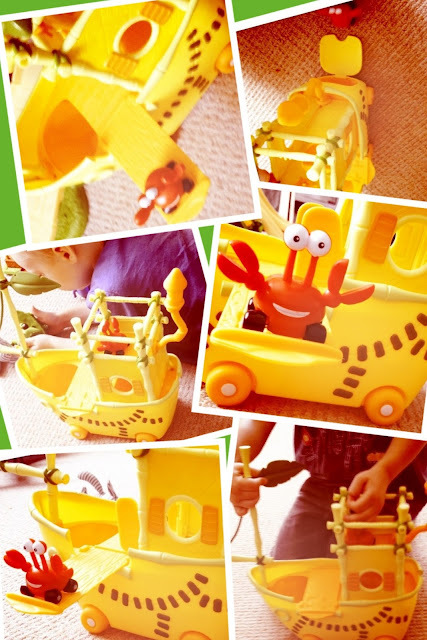 The Taxicrab boat is great fun - Blake, aged 3 absolutely loves this! The boat is a 3year old boys, dream! Brightly coloured "pirate ship" which includes some awesome features! There's a retractable plank which you can actually use to ping Taxicrab high into the air! We actually had this out for testing while I was watching the Olympic Diving - Blake loved getting Taxicrab to dive instead of walk the plank! The leafy roof can unclip - this is very handy for playtime as it means little hands can easily play - this is important for Cap'n Taxicrab to sail the boat! We clip the leafy roof back on for when its hideout time! As Taxicrab has wheels instead of legs, the boat is fully wheel accessible! There's a ramp to whizz below deck and a lift to climb up the tower - this is a hand powered lift which means this is a fab batteries-free toy (and great for developing fine motor skills)! The whole boat is on wheels which makes for plain sailing on the "living room carpet" ocean or the great river of "wooden kitchen floor"
All the Jungle Junction playsets are compatible so Taxicrab sometimes has shipmates on deck! There isn't any problems at all with this fab toy - except Blake found it hard to understand why he couldn't take the boat with us to the park and launch it into the duck pond! Jungle Junction is a great Disney BAFTA nominated pre-school cartoon series which Blake is a fan of - but in all honesty, I don't think you need to know what jungle junction is to really enjoy this boat playset- we love it! I also reviewed the Race Launcher Playset too.